A team of UVM students are working to help NASA prepare for a mission that will send rovers to the poles of the moon to mine for water ice. 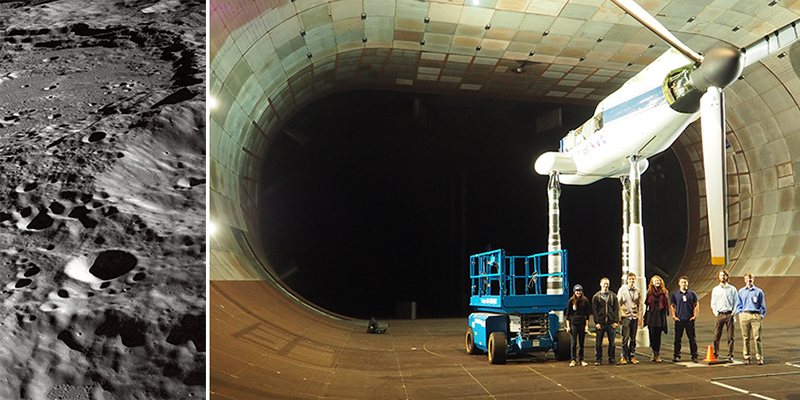 In March, students traveled to NASA Ames in Mountain View, California to present their progress; here, they’re standing in the biggest wind tunnel in the world. From left to right: senior Catherine Simpson; Ryan Vaughan and Paul Banicevic, systems engineers at NASA Ames; and seniors Liz Barrett, Thomas Durivage, Adam Potasiewicz, and Liam McAuliffe. Does NASA really need to reinvent the wheel? When it comes to navigating the moon’s surface, yes. It turns out that UVM is assisting the effort with cutting edge research from students who’ve been specially selected as participants in the highly competitive eXploration Systems and Habitation (X-Hab) 2018 Academic Innovation Challenge. UVM is one of just 11 university teams NASA chose to design systems and technologies that enhance the agency’s ability to explore deep space. Since early September 2017, engineering seniors Liz Barrett, Thomas Durivage, Liam McAuliffe, Adam Potasiewicz, Catherine Simpson and junior Boxiong Yang from the College of Engineering and Mathematical Sciences (CEMS) have been working to develop a single-wheel test bed that would aid NASA’s Resource Prospector mission, which aims to be the first robotic rover to search for water ice trapped in the lunar soil. The team is designing a rover wheel testing device compatible with NASA’s reduced gravity aircraft that allows wheel testing under simulated lunar gravity. The X-Hab project is an outstanding opportunity for these UVM undergraduate students and is just one example of the opportunities generated by the Vermont Space Grant Consortium (VTSGC), founded in 1992 as a statewide initiative and now overseen by Hitt, a professor of mechanical engineering in CEMS. “I’ve made it a priority to expand undergraduate opportunities in aerospace science and engineering,” says Hitt. Design competitions such as the X-Hab, weeklong summer workshops and NASA internships are among the ways that UVM students are finding a foot in the door at leading companies including Boeing, Blue Origin, the United Launch Alliance (ULA) and even SpaceX, which just sent a Tesla into space. “A number of our students have gone into aerospace engineering at high profile companies,” says Hitt. The work also reflects the interdisciplinary collaboration that happens across CEMS and UVM and is critical to the aerospace industry, adds Hitt. Such a process has turned frustrations into tremendous rewards, report both the students and their mentors. Learning the agility to respond immediately, graciously and accurately to a new design demand or constraints is an invaluable lifelong skill, as is learning professional coping mechanisms to avoid becoming overwhelmed by expectations. “It's a unique opportunity in that it is truly going to pay off in their careers,” says Hitt of the experience enjoyed by the students in the X-Hab 2018 Academic Innovation Challenge.